The author des­­cri­­bes how from the very begin­­ning, Mme Thanh’s abso­­lute prio­­rity was to the cause. Her stu­­dies and field trips in Europe, United States and the Soviet Union, led to the award of more than a dozen degrees and honours which gave her a unique insight into the law and its appli­­ca­­tion across the world and in Vietnam. It also ena­­bled her to build a net­­work of inter­­na­­tio­­nally reco­­gni­­zed and res­­pec­­ted scho­­lars, lawyers and aca­­de­­mics who would later play such an impor­­tant role in her life. Lawyer Ngo Ba Thanh retur­­ned from France with her family to South Vietnam in the early ’60s and, faced with the rea­­lity of war, she soon became active in the peace move­­ment. Mme Thanh gave up her com­­for­­ta­­ble life as the Dean of Saigon Comparative Law School to become a mili­­tant, joi­­ning in the people’s strug­­gle in the city to end the war. 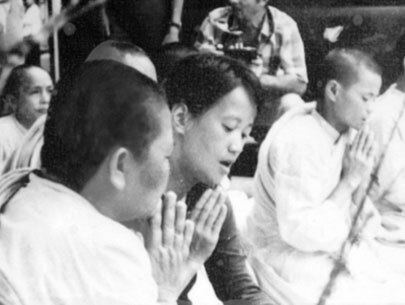 Recognizing also the neces­­sity of inter­­na­­tio­­nal sup­­port, Mme Thanh ral­­lied sup­­port from various American groups and signed a treaty with the Women’s International League For Peace and Freedom (WILPF). Patriotism, the right of self-deter­­mi­­na­­tion of the Vietnamese people and jus­­tice were convic­­tions shared by all dif­­fe­­rent poli­­ti­­cal fac­­tions in their fight for natio­­nal libe­­ra­­tion. By foun­­ding the Woman’s Movement For the Right To Live, she was able to gather women from all dif­­fe­­rent strata inclu­­ding ordi­­nary people from 36 dis­­trict mar­­kets – cal­­ling upon them to pro­­test in the streets toge­­ther with the Buddhist nuns and stu­­dents. Imprisonment, house arrest and loss of posi­­tion convin­­ced Mme Thanh that a woman can be a mother and a wife but only if she is first, a free citi­­zen of an inde­­pen­­dent coun­­try. 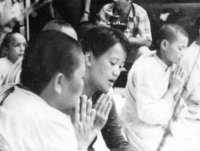 Thanks to the soli­­da­­rity shown by sup­­por­­ters in Vietnam and across the world, Mme Thanh was freed and soon reco­­gni­­zed as the leader of the Third Political Force. The author explains how Mme Thanh pro­­gres­­sed from being an aca­­de­­mic, a lawyer, through peace acti­­vist, to become leader of a woman’s poli­­ti­­cal force and how, after hos­­ti­­li­­ties ended, she became for almost 30 years, a res­­pec­­ted member of the National Assembly repre­­sen­­ting cons­­ti­­tuen­­cies in Ho Chi Minh City and Hanoi and various cons­­ti­­tuents ; women, lawyers and intel­­lec­­tuals. Her deter­­mi­­na­­tion, drive and com­­mit­­ment to the coun­­try never faded ; and from the early days of contri­­bu­­ting to the new Constitution of a uni­­fied Vietnam in 1976 towards the end of the 90s, she was one of the archi­­tects of Vietnam’s new laws gover­­ning foreign invest­­ment.